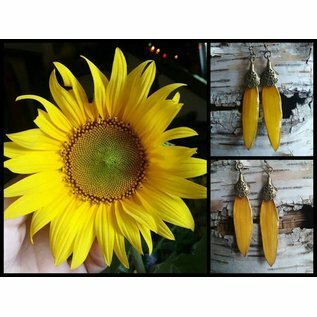 Beautiful, unique, and light-weight earrings made right from real sunflower petals. Enjoy these little rays of sunshine! Each pair is coated with a UV proof, water proof final coat.. Earwires are lead free, nickel free, cadmium free brass- safe for sensitive ears. Created by HeeBee Geebs in Warner, New Hampshire. "HeeBee Geebs is all about making quality products that aim to make things a little more positive in the world. If we feel great, and look great, maybe we will start being better to each other and the planet! HeeBee Geebs jewelry is inspired by nature, and tries to get everyone a little closer to mother earth. 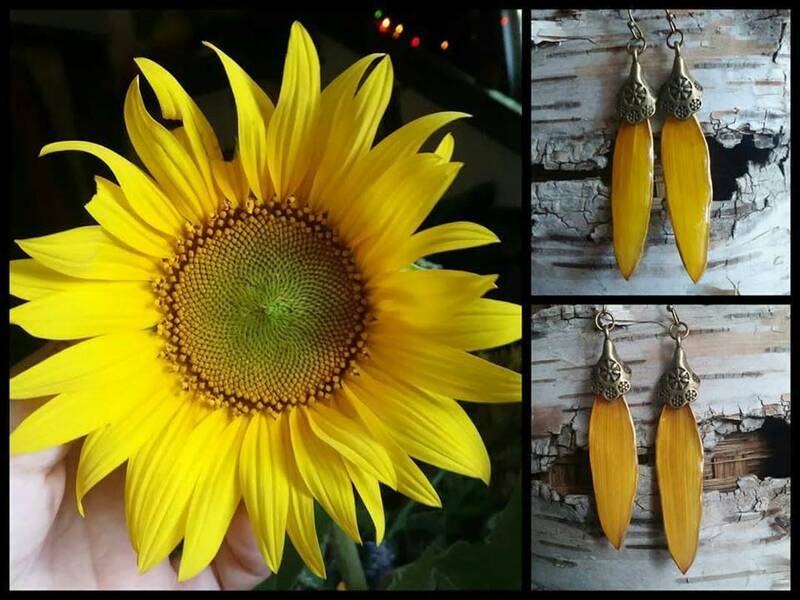 Each pair of sunflower earrings are made from REAL sunflower petals! Everyone can have their own little rays of sunshine to bop around with. Company founder and CEO Hillary Flanders was born in New Hampshire and has lived there for most of her life. She loves nature and everything outdoors, and has always found inspiration in the endless beauty that nature has to offer. She comes from a family full of incredible artistic talent, and is so pleased to have found her artistic niche combined with her love of nature."